Sometimes, because we spend so much time of our lives obsessing over video games, and anything related to the gaming world, really, we highly underestimate the need of an active physical life that we need as human beings, which should be as essential as eating and sleeping. Exercising on a regular basic is a must if you want to keep a balanced and healthy life, especially if want to keep playing video games for many years more. Now, I can totally understand that saying that is much easier said than done, and that is the reason for this article. We tried to mix up the thing that you enjoy the most, with that other thing you might be reluctant to start doing: Working out while playing video games. At first sight it may look like a hassle, but rest assured, with a little bit a creativity and perseverance, you can turn these useful tips into a habit. Every gamer out there knows how annoying and exasperating loading times can get, and let’s not even broach the subject of lagging. Now, knowing this hack, you’ll be able to kill two birds with one stone. What you can do is choose any type of exercise, and do as many as can in between loading times. Creativity is also part of the process: You could arrange sets of routines for each day of the week. In the first fortnight, five of each of the exercises mentioned above seem like a great way to start. And if you stick to the plan, it’ll quickly become a habit. 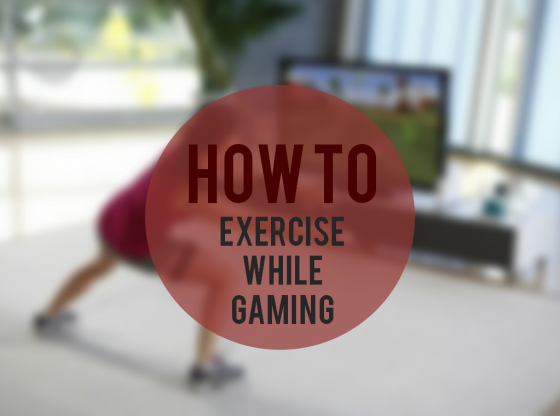 This tip can actually benefit you more than you may think, because not only will you get a healthy dose of exercise and movement to your daily routine, but apart from that, if done properly, you could also improve your gaming performance. Take breaks: Although at first glance it may look troublesome and a waste of time, taking a break from a long gaming session can benefit you later, because you will feel refreshed when you come back. Add to that a simple round of 15-20 minutes of exercises and you get a win-win situation. Exercise every time you die: Set yourself the rule of a mini workout for each time you die, that way, if you tend to lose games a lot, you can have a legitimate excuse to improve your gaming tactics. Exercise every time you win: This one’s the toughest of the three, but once you make it a habit, it’s the hack that will benefit you the most on both gaming abilities and your fitness life. Another fun way to take advantage of those endless gaming sessions is to set up an exercise bike right in front of your TV/monitor. Almost everyone has one, so it wouldn’t make any dent in your bank account. To get the best out of both situations, try this with a fast-paced, but easy-enough game: Fast-paced because the game will inadvertently make you pedal faster during key moments, and simple because, trust me, it won’t be easy to pedal and concentrate on the game at the same time. On the other hand, if you don’t happen to have a stationary bike at home and if you could make-do without some money, you could always enroll in a gym. I know it doesn’t sound as appealing, but you can even things up by playing your favorite mobile game while you’re doing cardio. Another alternative would be to actually play video games that involve significant movement, such as a dance routine or an imitation of a sport. Luckily, there are video games specifically for that. If you like to bust a move once in a while, then games like “Dance Dance Revolution”, or “Just Dance” are a perfect fit for you. They’re fun to play, and most importantly, they serve as a great way to do cardio. If you would like a more focused kind of exercise, there are always games like “Wii Sports”, and PlayStation’s “Sports Champion”. Zombies, Run is an awesome mobile app for jogging and running. The innovative thing about it is that it’s a immersive audio experience where once you put on your headphones, you get sucked into a zombie-filled world where sometimes you’ll have to run to save your life or the life of others. Hence, going for a jog while listening to Zombies, Run can turn a rather boring activity into a full-on adventure. In the unlikely case that you don’t find the appeal of working out while gaming, with offer you our idea of a middle ground: Download a work-out playlist that you think will motivate you to do it. And what better way than with a playlist of songs that remind you of your best adrenaline-fueled moments of gaming. We’ve already compiled such playlist, and you can find it if you click here.